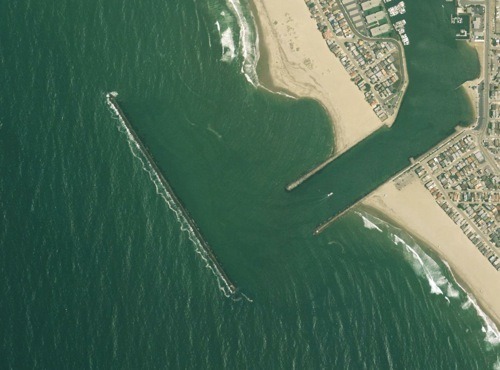 Back in the days when I kayaked on a daily basis, this route out around the breakwater would have been a milk run (see Google Earth screenshot above). But today, it was a reasonable start for some basic expedition training. It was quite gray under the marine layer this morning, despite the brilliant sunshine of the nearby inland areas. Winds were less than 10 kt with a 3 ft west swell, overall fairly calm. The route took me out the mouth of the harbor, around the north end of the breakwater, along the outside down to the south end, then through the harbor to a protected beach for lunch, and back to the launch. Conditions predictably picked up around the outside of the breakwater, with a confused sea generating waves from all directions. While manageable in my rusty state, it did get the heart pumping and put the head on a swivel looking for that next swell. Entering the south end took considerable attention. It was perfect for a first run. The smell of ocean mist on the wind coupled with the regular drone of the harbor’s fog horn paired nicely with the exercise to leave me happy and relaxed. Now off to schedule more training time and do a little expedition planning–oh yeah, and clean all that gear.